Embedding Server Dashboards in other Web Applications. Embed Server Dashboards provides option to render the dashboards into other web applications. 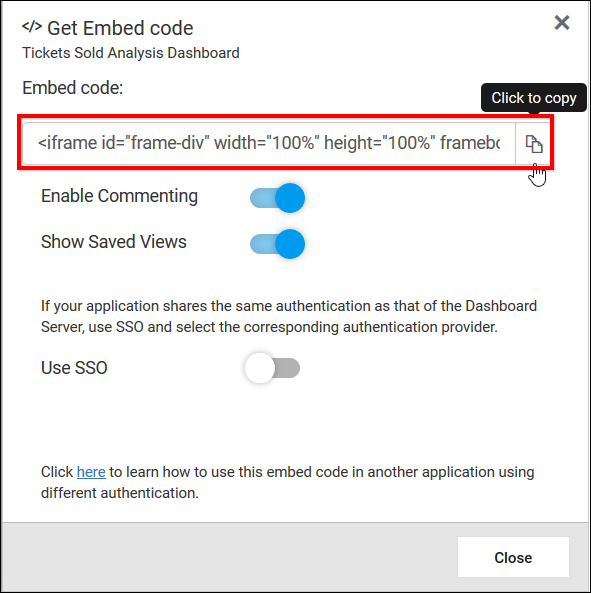 Follow the below steps to embed server dashboards into other web applications. 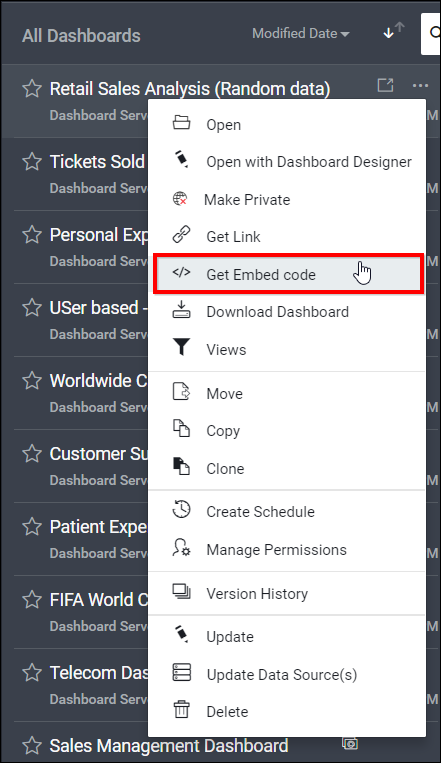 Click the Actions button in the dashboards grid context menu and select Get Embed code of the corresponding dashboards to embed. By Default, Saved Views and Comments are enabled. You can able to disable the Saved Views or Comments by sliding the Saved Views or Comments button as below. Copy the embed URL by clicking the copy icon from the Get Embed code dialog. Embed the copied URL into other web application with the help of the following code snippet. apiRequest.password = "admin"; //Password of the user.Its optional when validationkey and decryptionkey is used. Please find the below changes that have to be done to render the dashboard into the web application. Paste the copied Embed URL instead of the above iframe. Add the apiCall() function invoke in iframe onload event. Can able to get the token using either by passing the below three type of properties. Public dashboards does not need token to authenticate with Dashboard server. 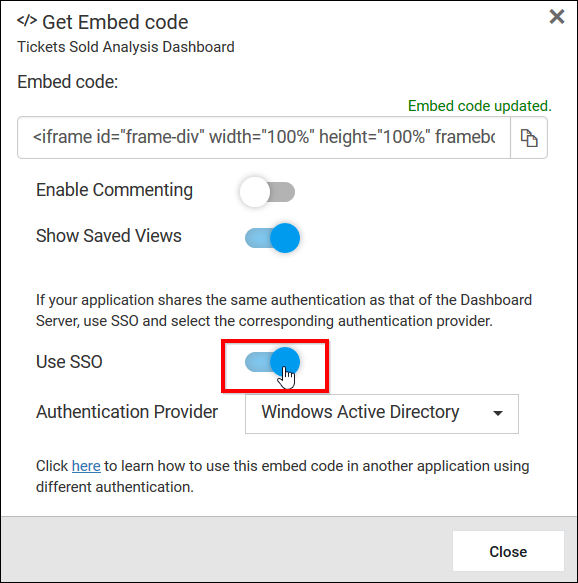 If the Dashboard server deployed into the machine which has configured with the Windows Active Directory, then follow the below steps to get the embed code with the Windows Active Directory SSO settings. Click the Actions button in the dashboards grid context menu Get Embed code and enable SSO and select Windows Active Directory as shown below. Paste the embed URL into an web application which has Windows Active Directory configuration. Run the web application and the dashboards will render automatically. 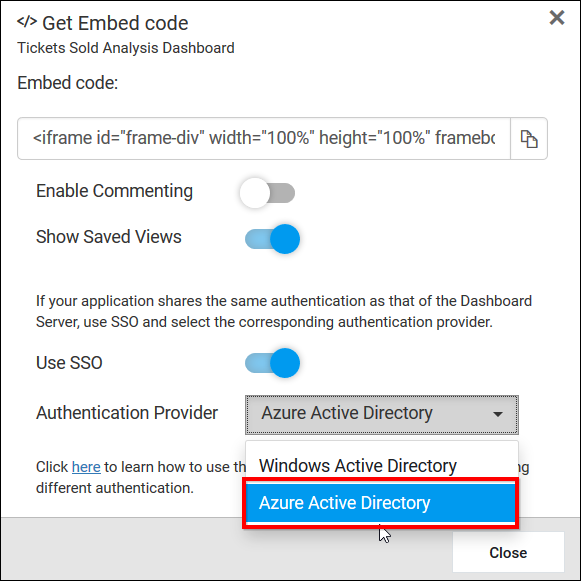 If the Dashboard server deployed into the machine which has configured with the Azure Active Directory, you can follow the below steps to get the embed code with the Azure Active Directory SSO settings. 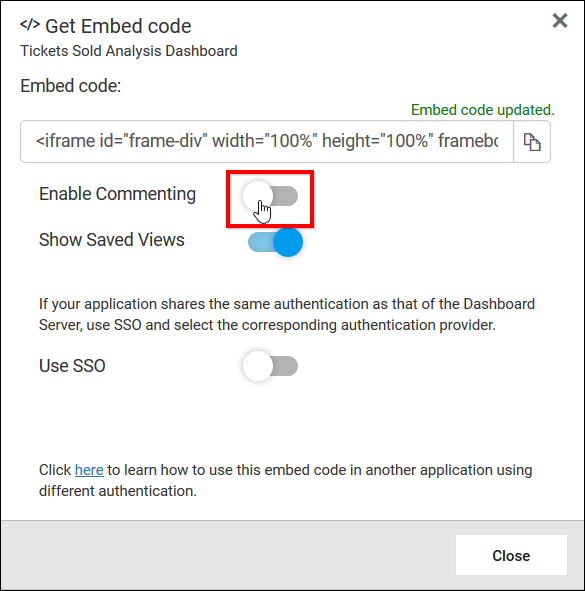 Copy the embed URL from the dashboards context menu Get Embed code and enable SSO and select Azure Active Directory as shown below. Paste the embed URL into an web application which has Azure Active Directory configuration.